For a second consecutive Friday, the Terriers failed to hold a two goal lead in the third period and eventually lost to UConn in overtime, 5-4. Adding insult to injury, the game-winning goal was scored by one-time BU commit, Max Letunov. BU dominated the first two periods, outshooting the Huskies 22 to 11. Chad Krys scored the only goal of the first period with a wrist shot from the point on a power play with Dante Fabbro and Brady Tkachuk assisting. Spencer Naas knotted the score on UConn’s first shot of the second period, beating Jake Oettinger from the high slot. BU answered a minute later when Bobo Carpenter fired home the rebound of a Hank Crone shot. With the teams skating four-on-four, BU worked a give-and-go with Brien Diffley scoring on a pass from Logan Cockerill for a 3-1 lead. Recalling last weekend’s loss to UMass, the Huskies cut the lead in half on Naas’s second goal, a power play tally. But this time BU restored the two-goal lead when Ty Amonte banged home the rebound of David Farrance’s shot. Midway through the period, Kasperi Ojantakanen pulled UConn within one again and four minutes later, another power play goal, this one by Alexander Payusov, evened the score at 4-4. 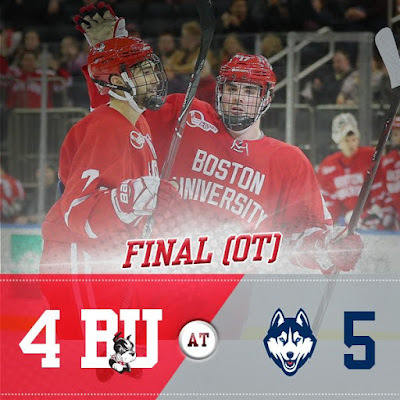 BU pressed to regain the lead but couldn’t put one past UConn’s Tanner Creel and the game moved to overtime. At 2:51 Letunov scored unassisted on a backhander past Oettinger. 2018 recruit Tyler Weiss’s goal, assisted by Jake Wise with less than two minutes left in regulation, capped Team USA’s third-goal comeback for a 5-4 win against Russia in the Five Nations Tournament in Plymouth, Michigan. Midway through the final period, Russia held a 4-2 lead when Joel Farabee’s 22nd goal of the season cut the lead in half. USA quickly tied the game, setting the stage for Weiss’s heroics. 2019 recruit Trevor Zegras scored his 12th goal of the season in the NTDP U17’s 3-1 win against host team Finland in the Five Nations Tournament Saturday morning. On Friday, the U17s blitzed Sweden 10-2 with Zegras scoring a goal and assisting on three other scores. Fellow recruit Case McCarthy also had a goal for the U17s.